X2 If you wanna go fast, it's going to take some time. It'd be nice if there was something more simple, but alas, between the lot of us, we might be able to figure something out. 1 year old Jegs cellulose filter. Straight E85. Filter looked great, could have re-used it. These are E85 injs that have been sitting in an engine for an extended period of time..
Is the one on the right plugged? Don't know. When I see this rust/crud, they go in the trash. Trying to flow them only contaminates the bench fluid. Aeroquip SS braided rubber hose, Aeromotive Eliminator in-tank pump with their SS pre-filter, Aeromotive 40 micron SS post filter, GM Flex fuel sensor "Y'd" into return line, 120 injectors, FAST XFI, new Ricks SS tank. Had E85 in tank for less than a year. Car started backfire under acceleration, then wouldn't accelerate, finally wouldn't idle. Long story short, found both fuel filters plugged up, injector baskets plugged up, and several injectors not operating. dropped tank and found black/ brown particles everywhere. Removed E85 blend out of tank, injectors cleaned by Chuck, replaced inline filter element with 10 micron paper element three times to get all the rubber remnants out and everything is great. FWIW, the stuff that I found will pass through a 40 micron filter and some will pass through the 5 micron fuel injector inlet basket. Will go back to E85 once I switch fuel lines to Teflon lined hose. As I make the conversion it seems like the goal is power at reasonable cost!! The filtering of any fuel is based on clean product at the engine, correct? since e-85 has the water / crud factor wouldn't a good filter at tank and another just before rail do the most to keep it all good? Is not the makeup of ethanol the reason i.e. octane / cooler & cost an interesting alternative and worth the higher maintenance required? Yes some fuel line updates are suggested but with a 28 yr. old car isn't that a good thing to address anyway? What material is used in that hose? I've been using nitrile for several years without any issues. Nitrile is fully compatible. Belie, you are correct that we MUST maintain our cars. E85 does require a little more than gasoline. I recommend you either talk to hose manufacturer or use Teflon. Paper or SS....up to you. I can tell you the filter basket in the fuel injectors is good down to 5 microns so get as close to 5 as you can. IMHO, rubber fuel line hose is NOT a good idea! 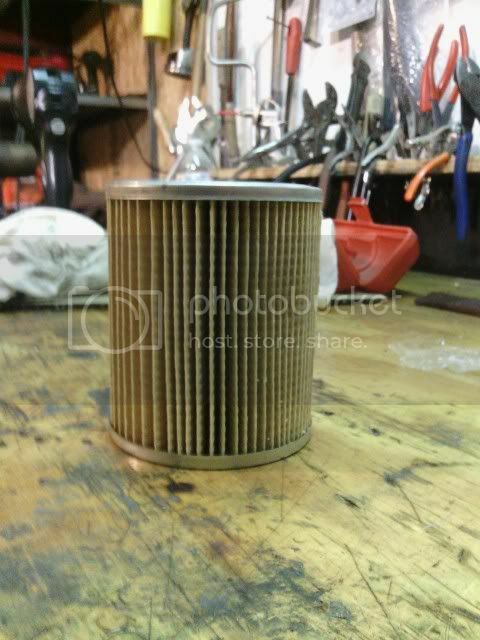 What's the micron rating with this filter? Just got another set of 120#r's on E85. 3 would clik under power, but not spray. The other 3 worked w/1 of them leaking. Tried several "triks", of which none worked. Baskets looked dirty, but the contamination was mostly all below the baskets. Oh ya, buy a new set of inj. Chuck, based on your findings & experience what is a diligent / aware person & concerned user of E85 to do to prevent such grief ? Does a 10 gal. cleanout with gas do it ? What's your thoughts on some F.I. cleaning additives with gas every 100 gal. of E85? Realizing that overall condition of the entire fuel system comes into play, assuming a clean updated system is intact would the above prevent these problems? As you mentioned, start w/ a clean system. I would use a pair of filters. A 40M before the pump, 10M after, if external. If in tank, be sure the filter socks are compatible w/85. 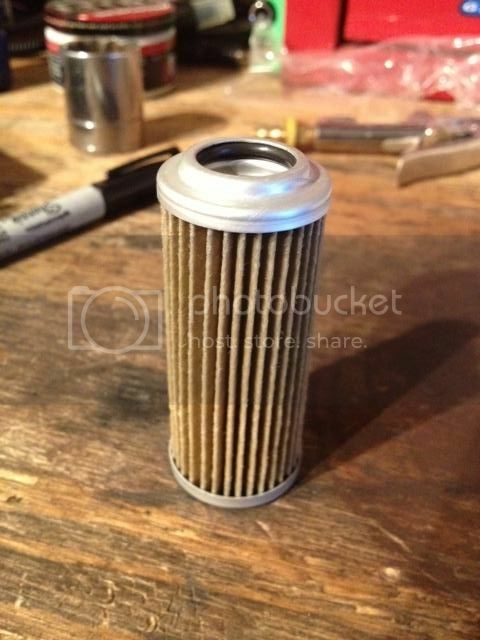 All accessible filters should be replaceable/cleanable. I guess you could still use 2 filters w/ the in tank pumps. Put the 10M as close to the rail as possible. Use compatible lines. PTFE, or nitrile rubber. An annual check up on the inj baskets is in order. An otoscope is a good tool. U can check the baskets, and read spark plugs w/ it. $40/Ebag. Carrying it a bit further, replace the baskets & o'rings every yr. The meth racers are using 2-3 inline filters and removing the inj baskets. Washing out w/ gas would only move the crud up to the inj baskets. Unless, the gas dissolves it. We had a set of ID2000 die on us as a result of leaving them sit in open air after ethanol running. Since then we run Lucas fuel additive and when ever we have our motor apart for an extended period I put the injectors in a jar of normal unleaded pump gas. Stops the rust and corrosion. I also put fresh filters in the injectors before putting them back in. No problems since. We use a single -10 Magnaflow filter at the rear. Sounds like you have a plan that works! Cant afford for it not to! Lol..